Wine, romance, and French bureaucracy - the ups and downs of an American's life in Paris. This laugh-out-loud memoir is almost too funny to be true! Drinking too much bubbly. Meeting sappy Frenchmen who have girlfriends or are creeps or both. Encountering problème after problème with French bureaucracy. When newly-single party girl Vicki moved to Paris, she was hoping to taste wine, stuff her face with croissants, and maybe fall in love. 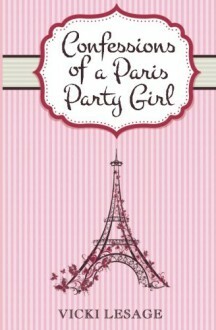 In her first book, this cheeky storyteller and semi-professional drinker recounts the ups and downs of her life in Paris. Full of sass, shamefully honest admissions, and situations that seem too absurd to be true, Vicki makes you feel as if you're stumbling along the cobblestones with her. Will she find love? Will she learn to consume reasonable amounts of alcohol? Will the French administration ever cut her a break? Read about Vicki's bumpy journey into motherhood in her second book, Confessions of a Paris Potty Trainer.